Writing about Siena made me crave a panino from a café I’ll write about later on. My first choice was a panino pomodoro, but my basil plant died, so I improvised this roasted vegetable sandwich with aioli and feta from what I had on hand. Before going to Italy, my experience with “panini” was limited to a few unimpressive trips to Bertucci’s. I’d thought that the only thing worse than Bertucci’s is Olive Garden; traveling to Italy has confirmed that. “Panini” is the plural of panino, which is what they’re called in Italy. An Italian sandwich does not need to be pressed ridiculously flat and grilled to hell in order to qualify as a “panini.” All of the panini I had were served on ciabatta or focaccia. Sometimes they were not grilled at all, and when they were, they were very lightly warmed, not even enough to melt the cheese, sometimes they were slightly warmed in the oven. They were never pressed flat. Cut the courgette (zucchini) to half length, then slice it thinly into long slices. Slice the peppers. Cut the onion into eight (or whatever size you like) wedges, and separate the layers. 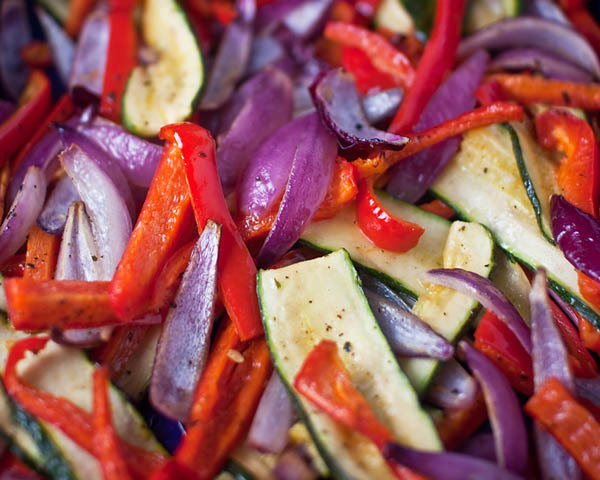 Toss the veggies with olive oil, salt, pepper, and basil. Bake at 350 degrees for about 25 minutes. This sandwich could’ve used a little more diversity, but like I said, I used what I had on hand. Aubergine (eggplant) would’ve been nice place of the second pepper, artichokes might’ve been nice, maybe some mushrooms, but you can get creative with your veggies and spices. At 25 minutes, the veggies were roasted and sweet, but not limp, which was exactly what I was after. While the veggies are roasting, whisk together the mayonnaise, lemon juice, and garlic. Spread it onto the bread, sprinkle the bread with feta, and put it in the oven for the last 5 minutes or so of veggie roasting. You don’t necessarily need to toast the bread, just get the chill out of feta. I’d have preferred this on ciabatta, but all I has was a white baguette, so that’s what I used. 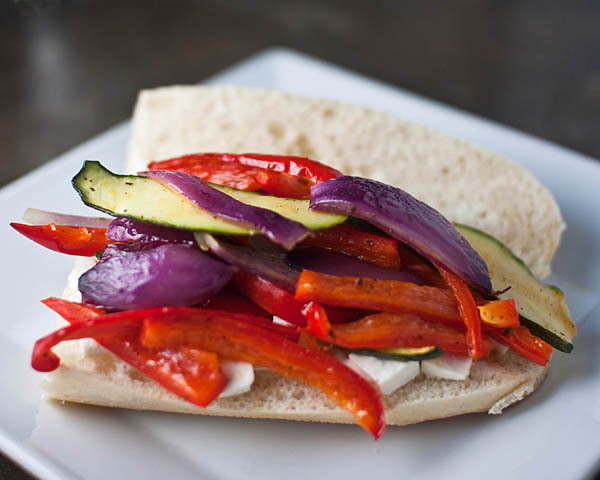 This sandwich has since evolved into my recipe for grilled veggie sandwiches with feta and aioli.